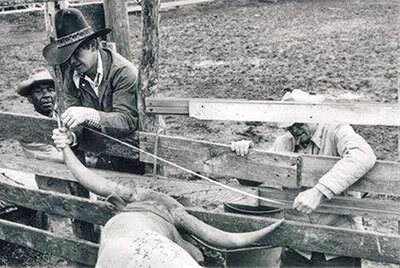 Texas Ranger JP - This is the historic measurement (about 1974) of the first 48" TL bull, Texas Ranger, JP. Measuring are TD Kelsey left and J.G. Jack Phillips Jr on the right. This was the greatest of the foundation bulls of the breed. He is in every pedigree at DCCI except one cow. He contributed flatter horn and larger beef conformation. Winchester is 21 times line bred to TR. It is easier to find cattle with Texas Ranger in their pedigree than those without him.